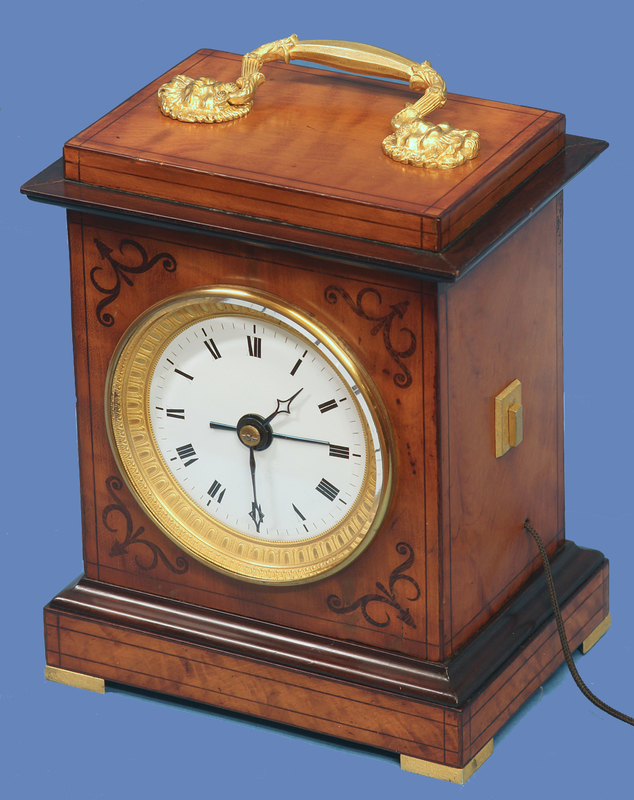 A rare early 19th century inlaid satin wood grande-sonnerie carriage clock with a jeweled ‘Cylindre en Pierre’ escapement and alarm by the eminent firm of Lepaute. 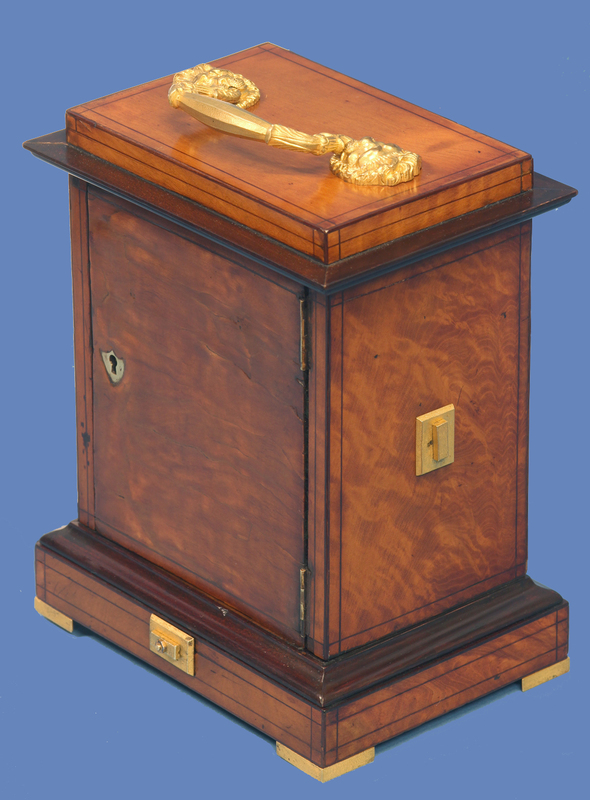 The well-proportioned inlaid satinwood case has mahogany moldings, is lined on the interior and bottom with thick ebonized veneer, has fabric in the bottom for the bells and has ormolu mounts that include a glazed bezel, a decorative swing handle with lions, square-cut feet and three adjustment slides. 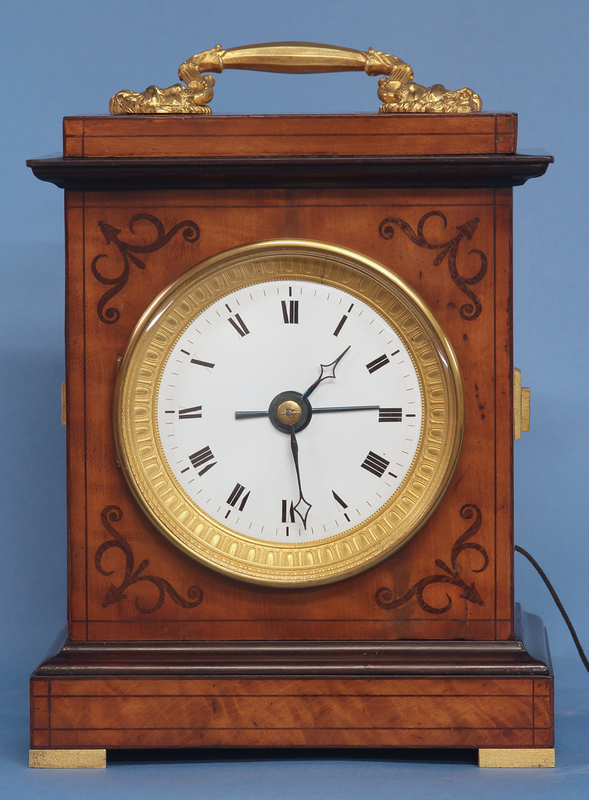 The white porcelain dial has bold black Roman numerals for the hours and steel-cut alarm and time hands. 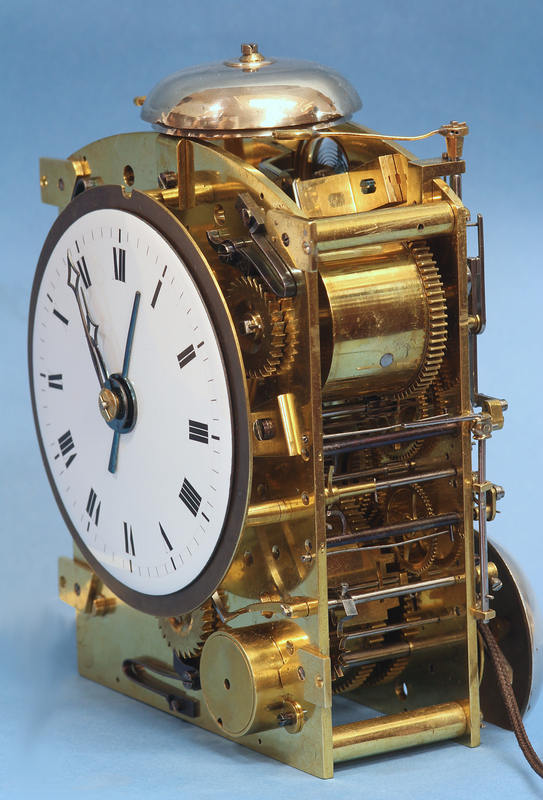 The large 8-day 3-train grand-sonnerie movement has arched plates, is wound off the backplate which also carries the strikework and is engraved ‘4 Crous en Cylindre en pierre, Lepaute a Paris’. 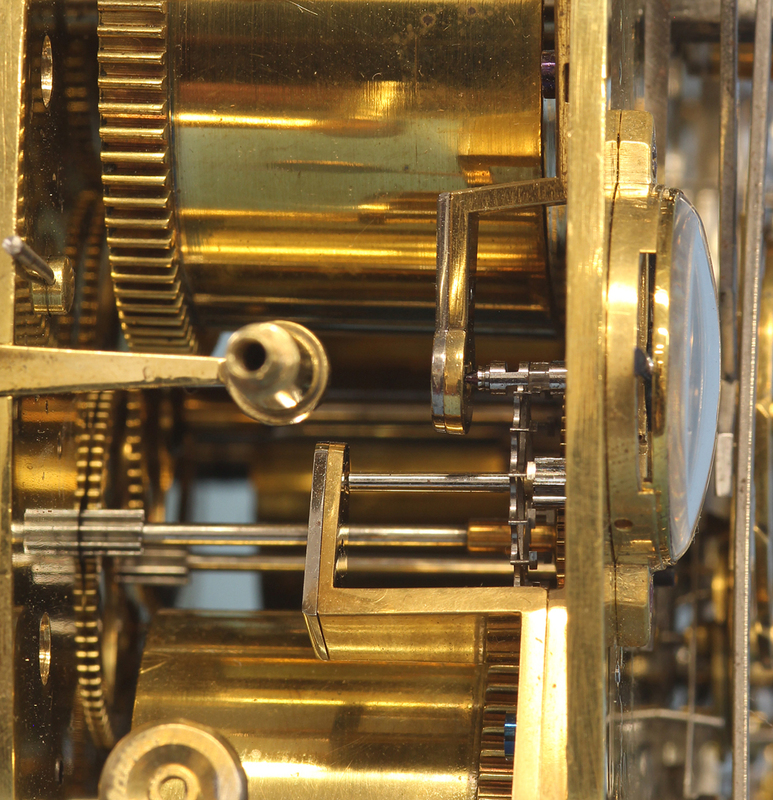 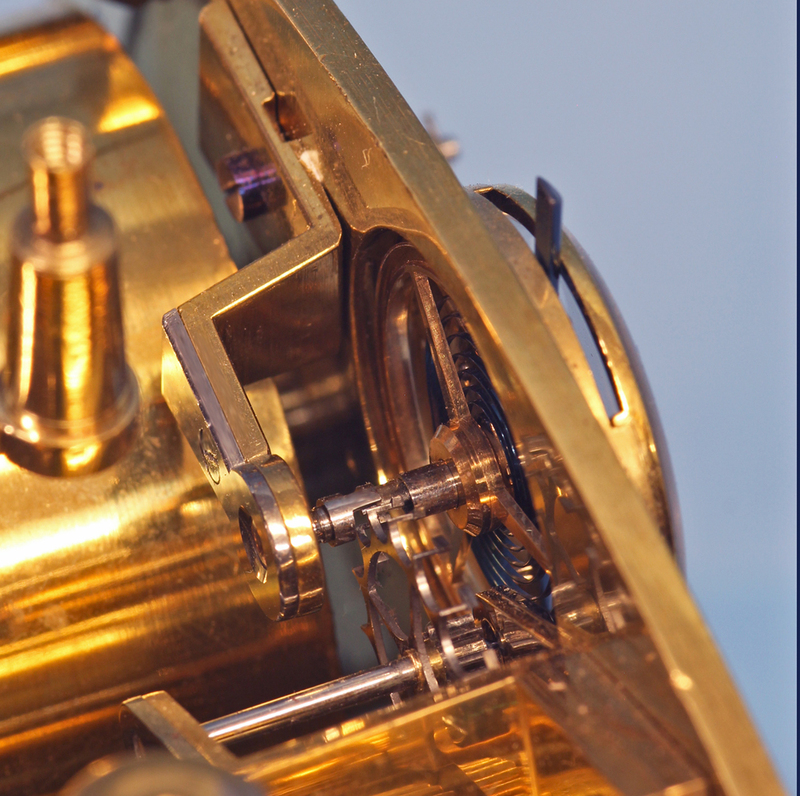 The ruby cylinder escapement is mounted at the top and has a three armed brass balance, a steel suspension spring with a steel regulator hand for fast/slow and sits behind a glazed cover. 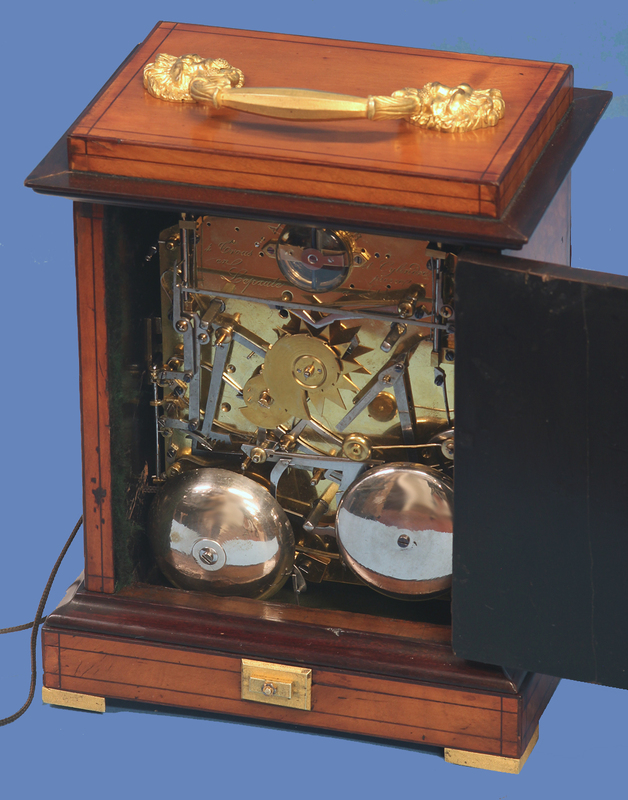 The three slide levers centered on the sides of the case are for repeat, quarter striking/grand-sonnerie striking and strike/silent. 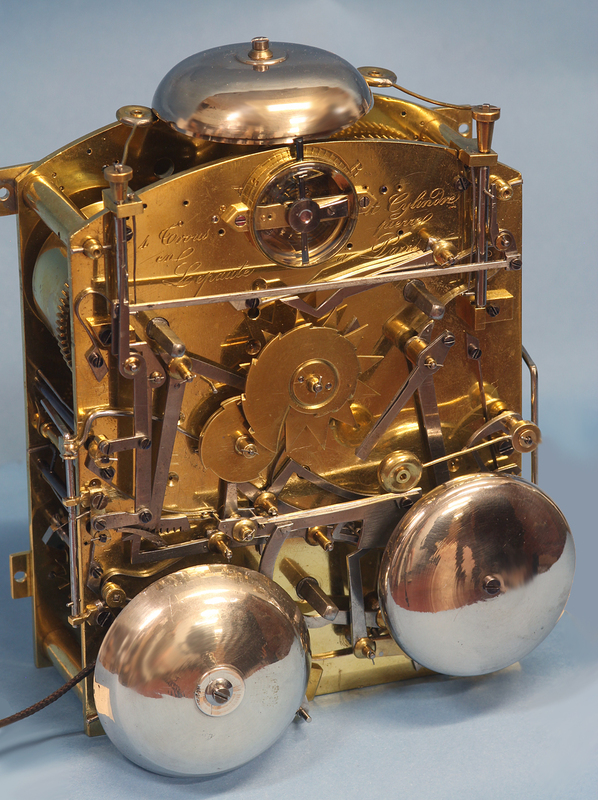 The hour bell is on the backplate, the quarters strike by torsion on the two bells above and the alarm which is wound by pull cord strikes on the forth bell at the back. 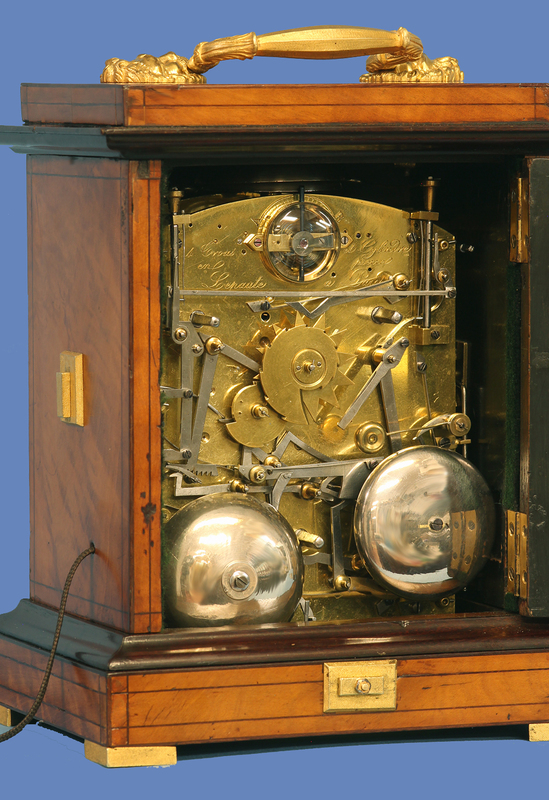 The movement takes up most of the interior and is mounted to the front of the case. 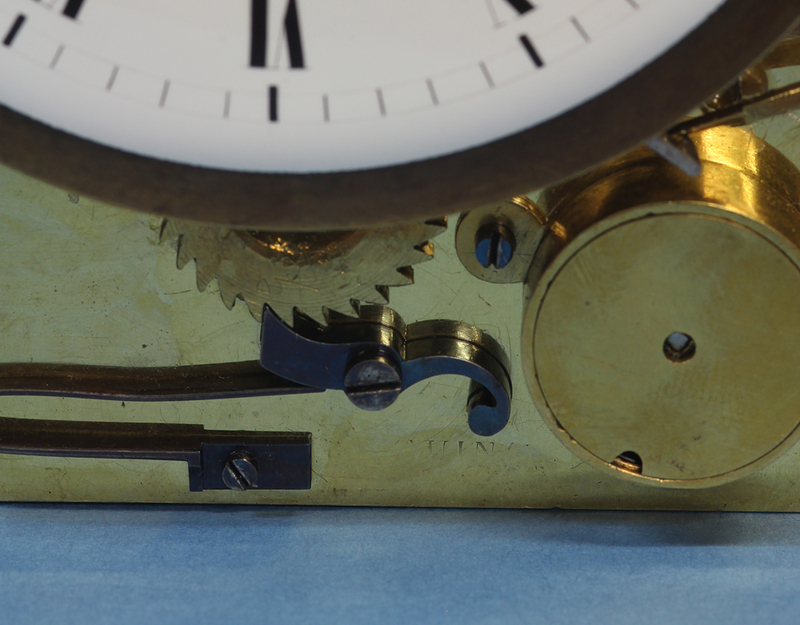 It is removed/installed by removing the four screws below and then the bottom of the case. 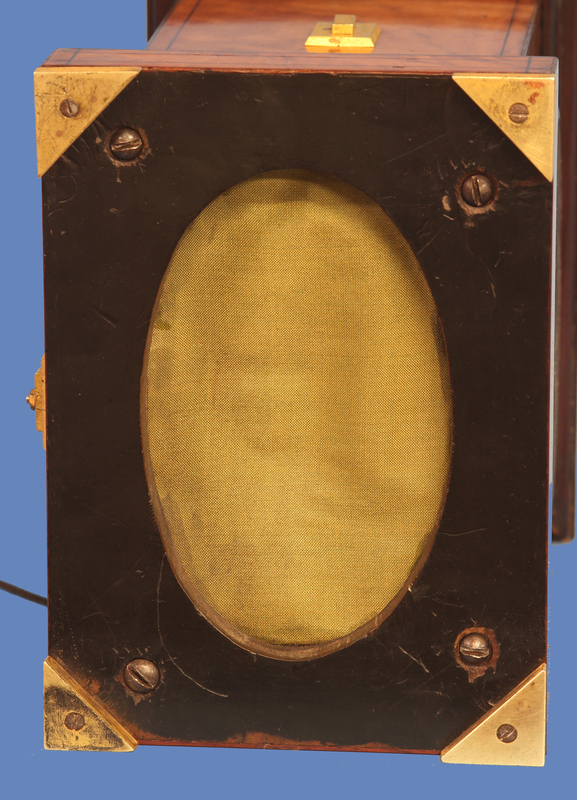 There is a partial name stamped into the frontplate that we have yet to identify, but is most like the maker of the ebauche. 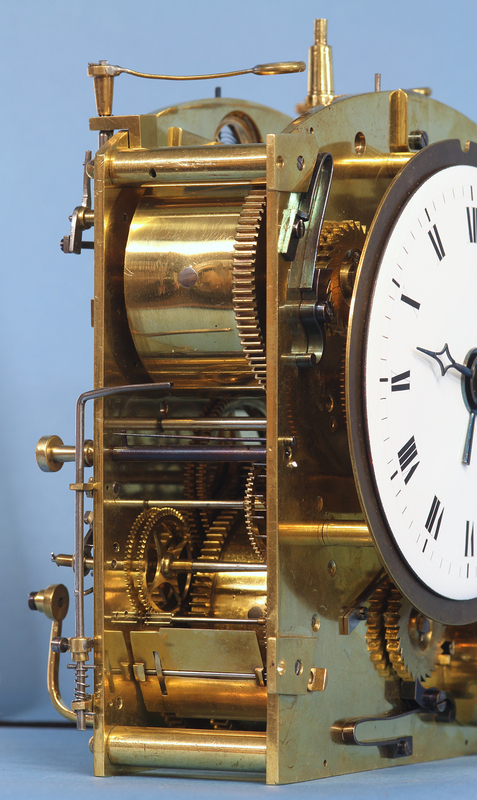 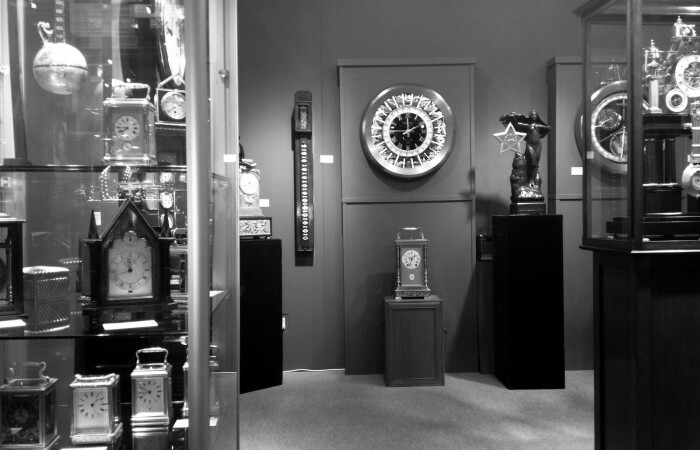 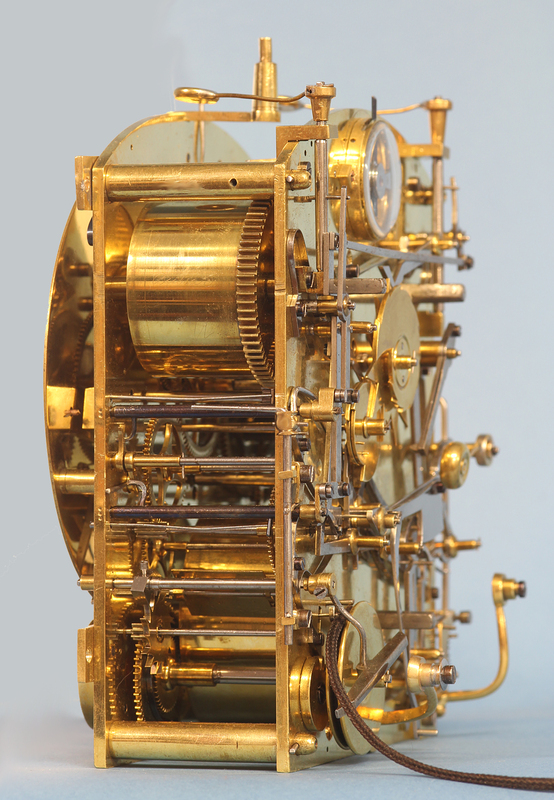 For another example of an early complicated giant carriage clock by Lepaute see: ‘A century of fine Carriage Clocks’, Fanelli, pg.64. 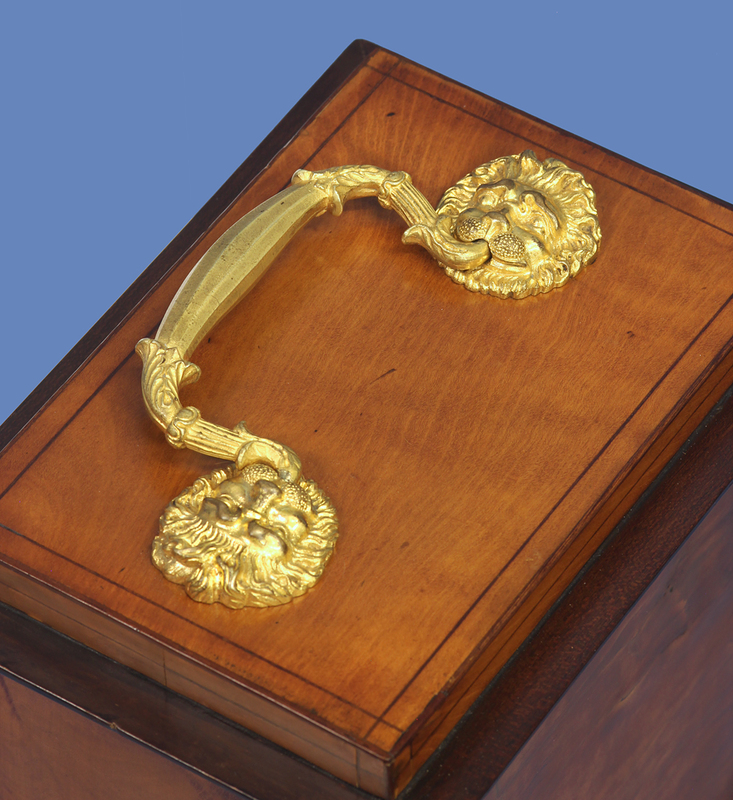 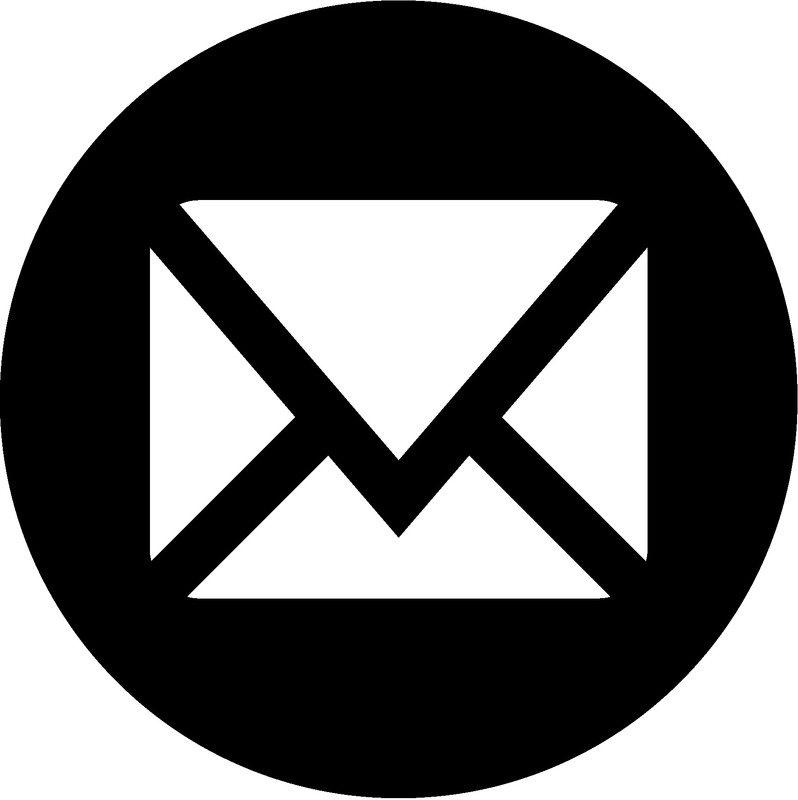 Size: Height to top of case w/out handle – 8.25in.